Cover Amount (Sum Assured):Rs.5,32,407 lakhs, Policy Term: 20 years, Premium Payment Term: 15 years, Premium Payment Mode: Annual, Premium:Rs.60, 000. Increase in benefit amount every year by bonus accural , if any. Will depend on the age of Life Assured, Premium Payment term opted and the Annualised Premium amount. Step 1: Choose the premuim amount you want to pay and the period you want to stay invested for. Step 2: Our Life Advisor will help you fill in the application form. Step 3: A cheque will have to be drawn in favour of Aegon Life Insurance Co. Ltd. Step 4: Expect a verification call from Aegon Life call centre, once you apply for the policy. This is a non-linked, participating plan. Bonus mentioned is simple revisionary bonus and it is a percentage of Sum Assured. • This document is for benefit illustration purpose only and should be read in conjunction with the sales literature to understand the product. As a With Profits Policyholder, you will share in the performance of the With Profits Fund and shall get a benefit over and above the guaranteed benefits under your policy. 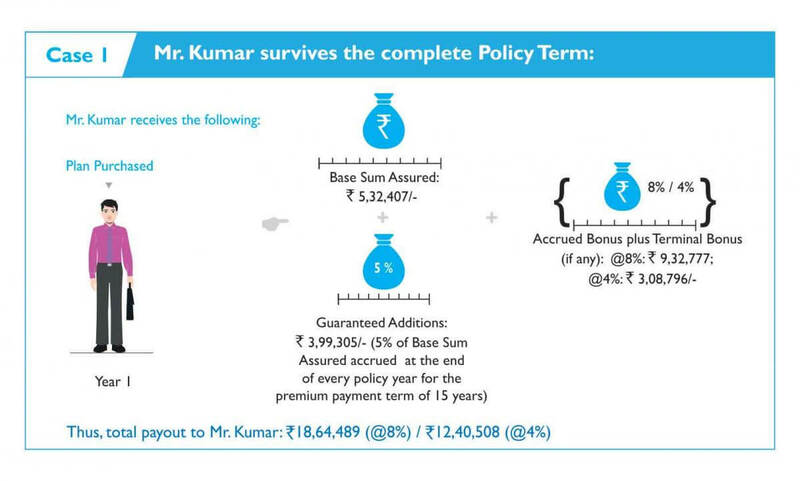 As this performance is non-guaranteed and depends on the future, the "Non-Guaranteed Benefits" section in this Illustration is provided to give you an indication of what this benefit could be if the fund earns on average 4% or 8% per annum over the term of the policy. Actual fund performance will vary from year to year. • The illustrated values based on the assumption of 4% and 8% gross investment returns per annum are not guaranteed and are for illustration purposes only. • The assumed investment returns of 4% and 8% per annum are not future bonus rates. Future bonus rates depend on several factors including but not limited to investment performance, company’s expenses, cost of providing risk benefits and the effects of taxation. • Service tax, Education cess and any other taxes announced by the Government or any other statutory body in future would be levied as per the applicable tax laws. The premium shown above is exclusive of service tax and cess. 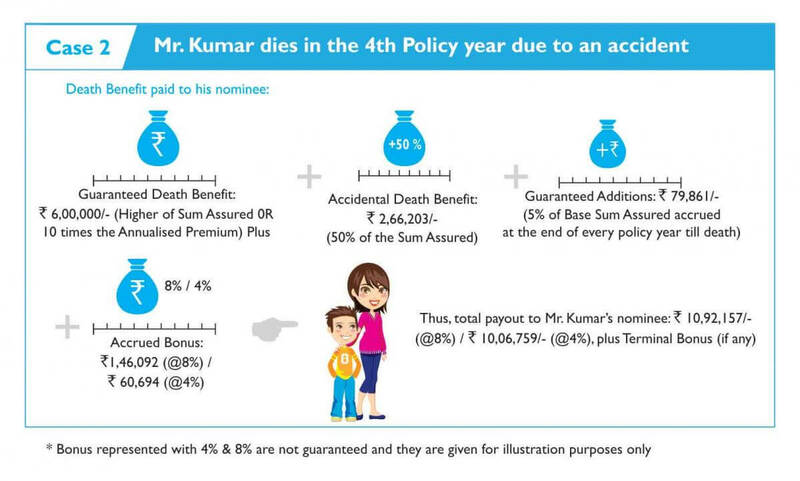 • This illustration assumes all premiums are paid when due. • For any further clarification, please feel free to contact the advisor or email us at customer.care@aegonlife.com.